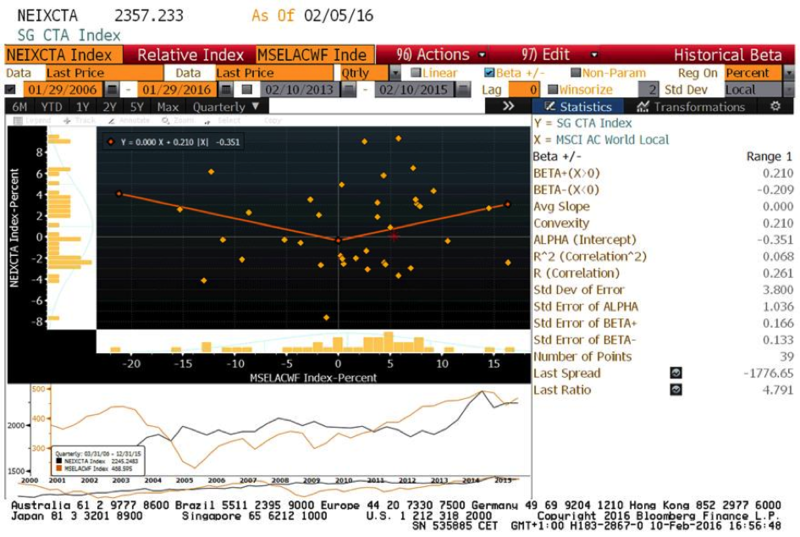 Will 2016 be the year for managed futures, CTA? Will 2016 be the year for managed futures? Linear regression showing quarterly performance over ten years of the Newedge CTA index and the MSCI World. This graph shows how CTAs generate large levels of alpha in both up and down markets but add very little value in a choppy environment where market performance is zero. It will be no surprise to readers of this blog that investors who were able to overweight managed futures (also known as Commodity Trading Advisors or CTAs) in their portfolio outperformed during market shocks, especially in 2008. January of this year is proving no exception with the Newedge CTA USD Index up 4.18% in a market where the MSCI World (also in USD) was down 5.35%. Generally, managed futures use technical/systematic models that utilize futures and forward contracts to trade long or short exposure to international equity indices, interest rates, currencies or commodities. Their sources of return vary but empirical evidence shows that generally managed futures strategies perform well during market downturns (Sep ‘08, Sep 11 ‘01, ‘98). This is the main reason they have been touted as natural hedges to an overall portfolio of risks (especially equity risk), carrying an implicit long volatility component. Again, not all managed futures funds make their money in the same way, but most seek to benefit from trends which, in their more basic form, are persistent price phenomena that stem from changes in risk premia. When risk premia increase or decrease, underlying assets have to be repriced and as long as there is uncertainty about the future, there will be trends for CTAs to capture. It is therefore also intuitive that there is a long volatility component in there. If you feel 2016 will be a year where global growth will be reassessed to the downside and markets question the ability of central bankers to restore stability, this could be the strategy for you. “There are many more advantages for investors” claims Manel Sarabia of NS Capitrade who runs a trend following strategy out of CM Capital Markets in Madrid. “As well as offering low levels of correlation to other investments (going from positive to negative depending on the trends essentially), they are highly diversified into anything from 50 to 200 different markets. CTAs are also very liquid (by the mere nature of the futures contracts they trade in) and offer transparency very few other managers can match. Capitrade for instance, offers clients real time access to all its positions through a web based portal” adds Sarabia. Buyers beware though. It seems intuitive to also assume that a manager following long or medium term trends will not be “automatically” well positioned to benefit from a trend reversal or market crash. This has been the case when trend following managers lost money during several corrections Oct ‘05, May ‘06, Aug ’08 and Aug ’11 (see graph above). On the other hand, when the trend is confirmed, their models should capture the movement very well… often helped at this stage by rising volatility. “Investors need to accept there will be volatility ‘along the way’ exemplified by the 2009 to 2013 period where a few quick reversals came to abruptly take away months of painstaking performance generation. The best managers carry over time a Sharpe ratio of 0.8 to 1 and if they annualize between 12% and 15% performance, you can assume 15% volatility and therefore peak-to-trough drawdowns of 20%. That’s the nature of the beast” concludes Poiret.